Gastric outlet obstruction (GOO, also known as pyloric obstruction) is not a single entity; it is the clinical and pathophysiological consequence of any disease process that produces a mechanical impediment to gastric emptying. Gastric outlet obstruction can be a diagnostic and treatment dilemma. Despite medical advances in the acid suppression mechanism, the incidence of GOO remains a prevalent clinical problem in benign PUD. Also, an increase in the number of cases of GOO seems to be noted secondary to malignancy; this is possibly due to improvements in cancer therapy, which allow patients to live long enough to develop this complication. As part of the initial workup, exclude the possibility of functional nonmechanical causes of obstruction, such as diabetic gastroparesis. Once a mechanical obstruction is confirmed, differentiate between benign and malignant processes because definitive treatment is based on recognition of the specific underlying cause. Carry out diagnosis and treatment expeditiously, because delay may result in further compromise of the patient's nutritional status. Delay will also further compromise edematous tissue and complicate surgical intervention. Orient initial management to identification of the primary underlying cause and to the correction of volume and electrolyte abnormalities. Barium swallow studies and upper endoscopy are the main tests used to help make the diagnosis. Tailor treatment to the specific cause. The stomach is located mainly in the left upper quadrant beneath the diaphragm and is attached superiorly to the esophagus and distally to the duodenum. The stomach is divided into four portions: cardia, body, antrum, and pylorus. Inflammation, scarring, or infiltration of the antrum and pylorus are associated with the development of GOO. The duodenum begins immediately beyond the pylorus and mostly is a retroperitoneal structure, wrapping around the head of the pancreas. The duodenum classically is divided into four portions. It is intimately related to the gallbladder, liver, and pancreas; therefore, a malignant process of any adjacent structure may cause outlet obstruction due to extrinsic compression. Intrinsic or extrinsic obstruction of the pyloric channel or duodenum is the usual pathophysiology of GOO; the mechanism of obstruction depends upon the underlying etiology. Patients present with intermittent symptoms that progress until obstruction is complete. Vomiting is the cardinal symptom. Initially, patients may demonstrate better tolerance to liquids than solid food. In a later stage, patients may develop significant weight loss due to poor caloric intake. Malnutrition is a late sign, but it may be very profound in patients with concomitant malignancy. In the acute or chronic phase of obstruction, continuous vomiting may lead to dehydration and electrolyte abnormalities. When obstruction persists, patients may develop significant and progressive gastric dilatation. The stomach eventually loses its contractility. Undigested food accumulates and may represent a constant risk for aspiration pneumonia. The major benign causes of GOO are PUD, gastric polyps, ingestion of caustics, pyloric stenosis, congenital duodenal webs, gallstone obstruction (Bouveret syndrome), pancreatic pseudocysts, and bezoars. PUD manifests in approximately 5% of all patients with GOO. 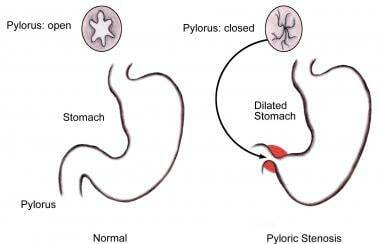 Ulcers within the pyloric channel and first portion of the duodenum usually are responsible for outlet obstruction. Obstruction can occur in an acute setting secondary to acute inflammation and edema or, more commonly, in a chronic setting secondary to scarring and fibrosis. Helicobacter pylori has been implicated as a frequent associated finding in patients with GOO, but its exact incidence has not been defined precisely. Anatomic changes associated with pyloric stenosis. Pancreatic cancer is the most common malignancy causing GOO. Outlet obstruction may occur in 10-20% of patients with pancreatic carcinoma. Other tumors that may obstruct the gastric outlet include ampullary cancer, duodenal cancer, cholangiocarcinomas, and gastric cancer. Metastases to the gastric outlet also may be caused by other primary tumors. The incidence of GOO in patients with peripancreatic malignancy, the most common malignant etiology, has been reported as 15-20%. Andersson A, Bergdahl L. Carcinoid tumors of the appendix in children. A report of 25 cases. Acta Chir Scand. 1977. 143(3):173-5. [Medline]. Gibson JB, Behrman SW, Fabian TC, Britt LG. Gastric outlet obstruction resulting from peptic ulcer disease requiring surgical intervention is infrequently associated with Helicobacter pylori infection. J Am Coll Surg. 2000 Jul. 191(1):32-7. [Medline]. Lam YH, Lau JY, Fung TM, et al. Endoscopic balloon dilation for benign gastric outlet obstruction with or without Helicobacter pylori infection. Gastrointest Endosc. 2004 Aug. 60(2):229-33. [Medline]. Taskin V, Gurer I, Ozyilkan E, Sare M, Hilmioglu F. Effect of Helicobacter pylori eradication on peptic ulcer disease complicated with outlet obstruction. Helicobacter. 2000 Mar. 5(1):38-40. [Medline]. Gouma DJ, van Geenen R, van Gulik T, de Wit LT, Obertop H. Surgical palliative treatment in bilio-pancreatic malignancy. Ann Oncol. 1999. 10 Suppl 4:269-72. [Medline]. Doberneck RC, Berndt GA. Delayed gastric emptying after palliative gastrojejunostomy for carcinoma of the pancreas. Arch Surg. 1987 Jul. 122(7):827-9. [Medline]. Abdel-Salam WN, Katri KM, Bessa SS, et al. Laparoscopic-assisted truncal vagotomy and gastro-jejunostomy: trial of simplification. J Laparoendosc Adv Surg Tech A. 2009 Apr. 19(2):125-7. [Medline]. Siu WT, Tang CN, Law BK, Chau CH, Yau KK, Yang GP, et al. Vagotomy and gastrojejunostomy for benign gastric outlet obstruction. J Laparoendosc Adv Surg Tech A. 2004 Oct. 14(5):266-9. [Medline]. Kim SM, Song J, Oh SJ, et al. Comparison of laparoscopic truncal vagotomy with gastrojejunostomy and open surgery in peptic pyloric stenosis. Surg Endosc. 2009 Jun. 23(6):1326-30. [Medline]. Hall NJ, Pacilli M, Eaton S, et al. Recovery after open versus laparoscopic pyloromyotomy for pyloric stenosis: a double-blind multicentre randomised controlled trial. Lancet. 2009 Jan 31. 373(9661):390-8. [Medline]. Jaffin BW, Kaye MD. The prognosis of gastric outlet obstruction. Ann Surg. 1985 Feb. 201(2):176-9. [Medline]. Khullar SK, DiSario JA. Gastric outlet obstruction. Gastrointest Endosc Clin N Am. 1996 Jul. 6(3):585-603. [Medline]. Kurtz RC, Sherlock P. Carcinoma of the stomach. Bockus Gastroenterology. 4th ed. Philadelphia: WB Saunders; 1985. Lillemoe KD, Sauter PK, Pitt HA, Yeo CJ, Cameron JL. Current status of surgical palliation of periampullary carcinoma. Surg Gynecol Obstet. 1993 Jan. 176(1):1-10. [Medline]. Lillemoe KD, Cameron JL, Hardacre JM, Sohn TA, Sauter PK, Coleman J, et al. Is prophylactic gastrojejunostomy indicated for unresectable periampullary cancer? A prospective randomized trial. Ann Surg. 1999 Sep. 230(3):322-8; discussion 328-30. [Medline]. Arciero CA, Joseph N, Watson JC, Hoffman JP. Partial stomach-partitioning gastrojejunostomy for malignant duodenal obstruction. Am J Surg. 2006 Mar. 191(3):428-32. [Medline]. Bergamaschi R, Marvik R, Thoresen JE, Ystgaard B, Johnsen G, Myrvold HE. Open versus laparoscopic gastrojejunostomy for palliation in advanced pancreatic cancer. Surg Laparosc Endosc. 1998 Apr. 8(2):92-6. [Medline]. Alam TA, Baines M, Parker MC. The management of gastric outlet obstruction secondary to inoperable cancer. Surg Endosc. 2003 Feb. 17(2):320-3. [Medline]. Kantsevoy SV, Jagannath SB, Niiyama H, Chung SS, Cotton PB, Gostout CJ, et al. Endoscopic gastrojejunostomy with survival in a porcine model. Gastrointest Endosc. 2005 Aug. 62(2):287-92. [Medline]. Chopita N, Vaillaverde A, Cope C, et al. Endoscopic gastroenteric anastomosis using magnets. Endoscopy. 2005 Apr. 37(4):313-7. [Medline]. No JH, Kim SW, Lim CH, Kim JS, Cho YK, Park JM, et al. Long-term outcome of palliative therapy for gastric outlet obstruction caused by unresectable gastric cancer in patients with good performance status: endoscopic stenting versus surgery. Gastrointest Endosc. 2013 Jul. 78 (1):55-62. [Medline]. Chopita N, Landoni N, Ross A, Villaverde A. Malignant gastroenteric obstruction: therapeutic options. Gastrointest Endosc Clin N Am. 2007 Jul. 17(3):533-44, vi-vii. [Medline]. Holt AP, Patel M, Ahmed MM. Palliation of patients with malignant gastroduodenal obstruction with self-expanding metallic stents: the treatment of choice?. Gastrointest Endosc. 2004 Dec. 60(6):1010-7. [Medline]. Adler DG, Merwat SN. Endoscopic approaches for palliation of luminal gastrointestinal obstruction. Gastroenterol Clin North Am. 2006 Mar. 35(1):65-82, viii. [Medline]. Baron TH. Surgical versus endoscopic palliation of malignant gastric outlet obstruction: big incision, little incision, or no incision?. Gastroenterology. 2004 Oct. 127(4):1268-9. [Medline]. Telford JJ, Carr-Locke DL, Baron TH, Tringali A, Parsons WG, Gabbrielli A, et al. Palliation of patients with malignant gastric outlet obstruction with the enteral Wallstent: outcomes from a multicenter study. Gastrointest Endosc. 2004 Dec. 60(6):916-20. [Medline]. Song GA, Kang DH, Kim TO, Heo J, Kim GH, Cho M, et al. Endoscopic stenting in patients with recurrent malignant obstruction after gastric surgery: uncovered versus simultaneously deployed uncovered and covered (double) self-expandable metal stents. Gastrointest Endosc. 2007 May. 65(6):782-7. [Medline]. Maetani I, Mizumoto Y, Shigoka H, Omuta S, Saito M, Tokuhisa J, et al. Placement of a triple-layered covered versus uncovered metallic stent for palliation of malignant gastric outlet obstruction: a multicenter randomized trial. Dig Endosc. 2014 Mar. 26 (2):192-9. [Medline]. Yim HB, Jacobson BC, Saltzman JR, Johannes RS, Bounds BC, Lee JH, et al. Clinical outcome of the use of enteral stents for palliation of patients with malignant upper GI obstruction. Gastrointest Endosc. 2001 Mar. 53(3):329-32. [Medline]. Del Piano M, Ballare M, Montino F, Todesco A, Orsello M, Magnani C, et al. Endoscopy or surgery for malignant GI outlet obstruction?. Gastrointest Endosc. 2005 Mar. 61(3):421-6. [Medline]. Wong YT, Brams DM, Munson L, Sanders L, Heiss F, Chase M, et al. Gastric outlet obstruction secondary to pancreatic cancer: surgical vs endoscopic palliation. Surg Endosc. 2002 Feb. 16(2):310-2. [Medline]. van Hooft JE, van Montfoort ML, Jeurnink SM, et al. Safety and efficacy of a new non-foreshortening nitinol stent in malignant gastric outlet obstruction (DUONITI study): a prospective, multicenter study. Endoscopy. 2011 Aug. 43(8):671-5. [Medline]. Mansoor H, Zeb F. Enteral stents are safe and effective to relieve malignant gastric outlet obstruction in the elderly. J Gastrointest Cancer. 2015 Mar. 46 (1):42-7. [Medline]. Huang YL, Lee HC, Yeung CY, et al. Sonogram before and after pyloromyotomy: the pyloric ratio in infantile hypertrophic pyloric stenosis. Pediatr Neonatol. 2009 Jun. 50(3):117-20. [Medline]. Upper endoscopy showing multiple gastric polyps. Such polyps are a major cause of gastric outlet obstruction. Plain radiograph of the abdomen. Enlarged stomach with calcified content. Contrast study demonstrating an enlarged stomach. The point of obstruction is visualized at the pyloric-duodenal junction (string sign). Completed myotomy in open pyloromyotomy for hypertropic pylotic stenosis. Robotic-assisted esophagectomy pyloroplasty. Courtesy of Memorial Sloan-Kettering Cancer Center, featuring Inderpal S. Sarkaria, MD.